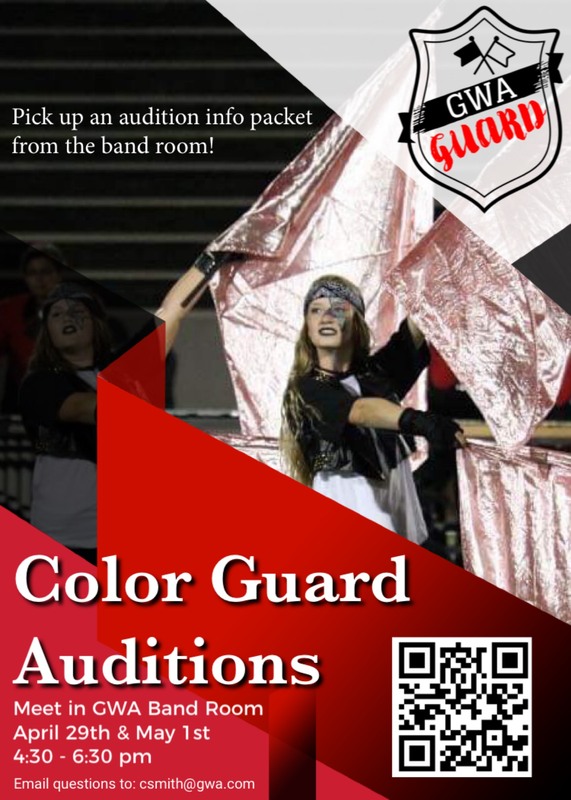 The GWA Guard is a vital component of the Marching Bulldog Band. These young ladies work extremely hard every summer and fall to become the pageantry and beauty associated with the marching band activity. Ms. Caroline Maughon has dedicated herself to making this group one of the most outstanding color guards in the state of Georgia. GWA's guard has continuously finished at the top of their class at every competition, been awarded superior ratings, and has worked hard to continue to stay at the top of their game. Our catch phrase with the guard is – “The winds and percussion tell the story, the guard paints the picture." Tryouts are held every spring in the band room and Ms. Maughon brings in a panel of judges to ensure the guard has the very best that George Walton has to offer. Click here for the audition information packet. For more information, please contact Ms. Maughon. Click here for the Audition Welcome Packet.